If you are using WhatsApp to chat with lots of people and groups, you may have some contacts or groups that you are especially interested in. While it is possible to access the latest messages the normal way, you can also speed things up a little by creating contact shortcuts on your Android device. The main advantage here is that you can open those contacts directly without having to start WhatsApp first before you can do so. That's especially useful if you have lots of contacts and groups listed on WhatsApp's start page, as it may take some time to find the right contact to browse the most recent messages or write new ones. It is actually very simple. The first thing you need to do is start the WhatsApp application on your Android device. Note: I can only test this on Android, it may work on other operating systems as well, but I was not able to test this. Once WhatsApp has been opened, you should see the list of contacts and groups. All you need to do now is long-tap on the contact that you want to create a shortcut for. A context menu is displayed on the screen after a short period of time that you can use to create a new conversation shortcut. 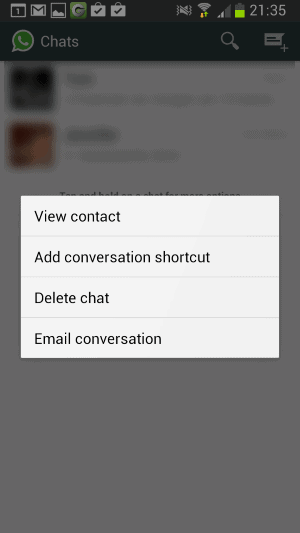 When you select the "add conversation shortcut" option from the menu, a shortcut is added to Android that you can use to load that contact directly in WhatsApp. The icon displays the image of the contact or group, so that it can be easily identified. Shortcuts can also be created in a different way. Instead of long-tapping on contacts or groups, you open the conversation view instead first. Tap on the menu button of your device and select more from the menu that opens up. Here you can now select the "add shortcut" option from the menu to add a shortcut to your home screen. Shortcuts may speed things up for you, at least a little bit. While this is usually not something that moderate WhatsApp users may want to do, it may help users who write a lot of messages throughout the day to a small group of contacts.